On the outskirts of Batumi, a beach town on the Black Sea popular with Georgians, Russians, Turks and Israelis, Teimuraz Ajiba sits down to pose for a portrait. We are outside the city’s worn-down tuberculosis (TB) hospital. Ajiba has a wide smile and a strong, wiry frame. He says he feels better, despite his treatment being paused while his liver recovers from the toxic drugs – and despite TB being just one of his problems. He also suffers from hepatitis B, hepatitis C, skin cancer and HIV. To complicate matters, his TB is ‘drug-resistant’: for Ajiba, the standard antibiotics no longer work. 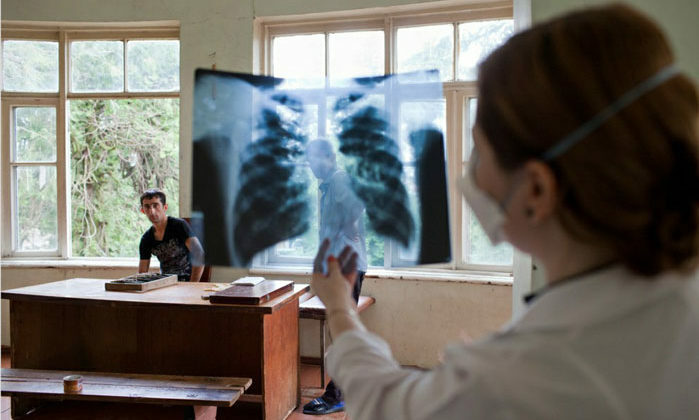 Multidrug-resistant TB or ‘MDR-TB’, as it is known, requires up to two years of pills and injections. This treatment is much less effective, using so-called ‘second line’ drugs with often harsh side effects – such as deafness, psychosis, nausea and, in his case, liver toxicity that aggravates his hepatitis.